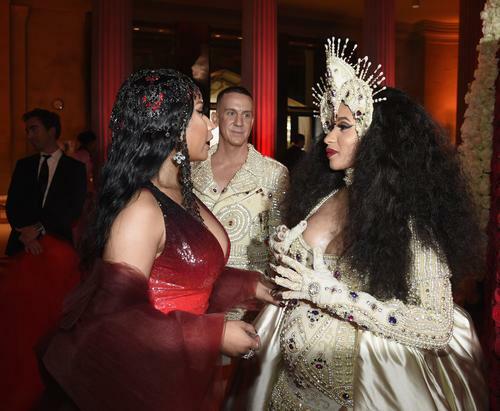 According to various reports, female rappers Cardi B, and Nicki Minaj have continued to share an on-and-off again feud with each other. But this time around the Chun-Li crooner,Nicki Minaj has surprised fans as she gave the new mom, Cardi B, a gift worth $5000! That's really amazing. According to The Blast, Nicki Minaj gifted the new mom a $5000 baby basket from exclusive Los Angeles baby boutique Petit Trésor. ‘The basket was bought minutes after the birth announcement was made,’ reported the publication according to a source. ‘The requirements for the basket were to “make it as girly as possible”, and was stuffed with some of the store’s most sought-after products including luxury seasonal clothes, an assortment of dolls and stuffed animals and, of course, a sterling silver rattle’. They added that some of the items seen in the basket were also "luxury organic pampering items for Cardi as well". According to the insider, "Nicki’s basket has already been shipped express post to her fellow rapper’s Atlanta home, and should arrive by end of day". Meanwhile,It was reported that the American Rapper, Cardi B, got to the hospital on Monday morning but delivered on Monday night,so Nicki Minaj's kind gesture came after Cardi B announced that she has delivered,naming her baby Kulture Kiari Cephus.